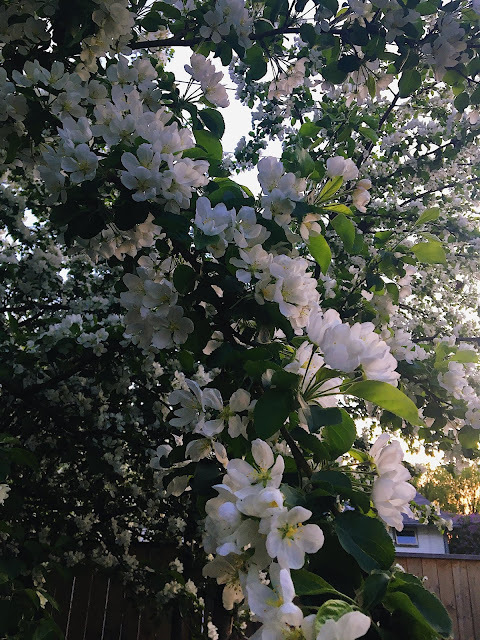 I turned 27 on Victoria Day and came home to my own White Way of Delight, dreamy apple blossoms in full bloom! I have been anticipating 27, and for some strange reason I was excited for this certain age. It holds so much promise in my mind...it feels like a real adult age, where I will be the woman I imagined I would be in my late twenties...rather than, truthfully, feeling still 22 or 23. Even though I know it doesn't work quite like this, I feel this age calling me to stand a little taller, try a little harder. I'm trying to verbalize some abstract thoughts here, for my own memories. So I can look back and see how I did, in my twenty seventh year. Calling myself to action, in a way. But at the same time remembering that I am always going to be myself..but different versions. And I want the 27th version to be memorable. For how I really tried to make life more beautiful and ordered for myself and my family, and had a servants heart while doing it all for the greater glory of God. It might be lofty, but why not aim high! I may not end up where I aimed, but I might end up higher than if I had lower expectations. And to be realistic I am reminding my future self right now to couple this all with grace, lots of grace. And to conclude my warm thoughts on being 27, I have a new baby growing inside that I am excited and longing for in a new way that I haven't yet experienced. 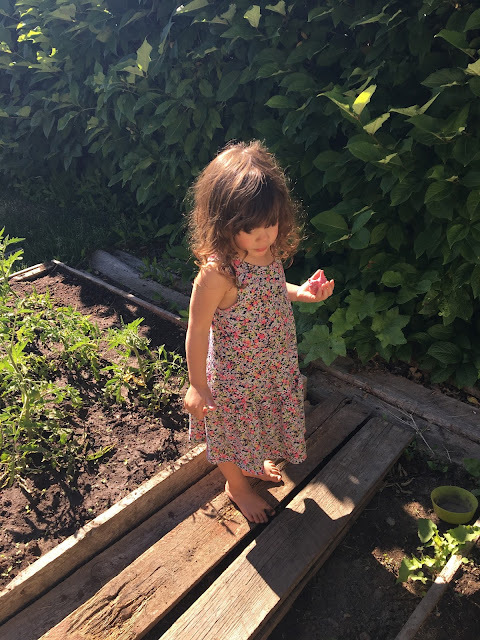 Maybe it is the growing of love and enjoyment of being essentially out of the baby stages with my older girlies, or maybe it's a truer sense of the gravity of a new life brought into being. All I know for sure is that I love this baby deeply! Happy birthday! I happened upon your blog a while back and enjoy reading your posts. You remind me a lot of myself and my husband as we have little ones and aspire to live life in a joyful, intentional, holy way. May God's blessings be upon you and your growing baby! On Saturday, June 24, 2017 we started our year of no screen time for the girls. We even put our tv into storage. I've had a difficult time writing this because I don't want it to come across as negative or judging anyone for how they parent. So please read this through the lens of it being our particular story at this time of our life. I'm hoping to be vulnerable in case there are some people out there who could relate. And even if you are at a different, better place with screens, I hope it will still be an interesting journey, I will need some cheerleaders! I have come to a realisation. 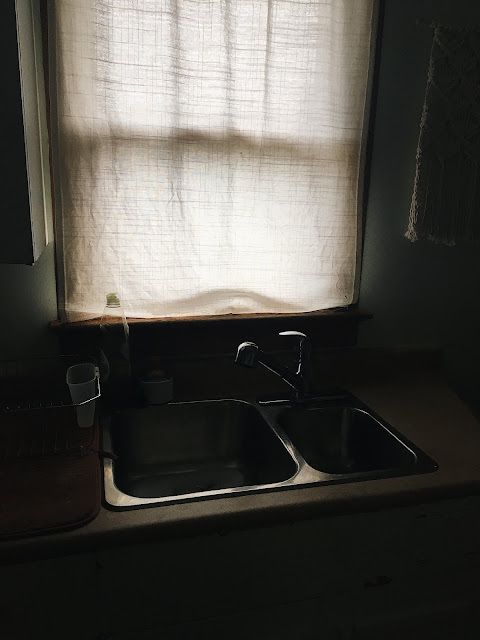 I want to be home, I crave home. But so often I am escaping my home. Because it's not what I want it to be...yet. Not right now. But it's not going to get there if I'm not there. Even sometimes when I'm there, I'm not there. I'm peering into others "there" through a small, driveway-cracked screen. I know I am capable of transforming the clutter, the not quite right yet. But it requires intentionality, and presence. Which is simple, but not easy. But possible, and that's where I'm at right now. Believing it is possible to get things to where I want them to be.